The fabric I am using for the chausible and stole is 55 inches wide. I am using the same fabric for BOTH SIDES of the stole. How much fabric do I need to buy? I ordered these patterns from your site. Comments for How much fabric is needed? You will need an extra yard if you are going to use the fabric for both sides of the stole, so five yards should work. 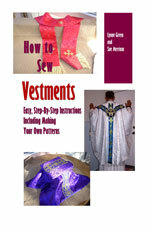 Since your fabric is only 55 inches wide, you will have to make the chasuble only 55 inches wide. The sleeves will be a little shorter, but it should work.